Goldyear Industrial Limited and its subsidiary TP Lighting Technology Limited recently launched together a series of innovative glare-free LED lamps during 2014 HK International Lighting Fair. These new products utilized secondary reflective optical design and precise angle measurements, which make the light perfectly reflected out through the reflector. Besides, they also possess numerous advantages like small size, lightweight, superior heat dissipation, as well as high power and high lumen output. 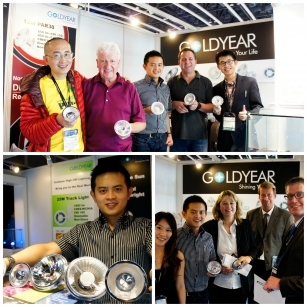 Thanks to the unique and innovative product design among the market, Goldyear received many inquiries from potential buyers during the fair and some of them are now discussing the possibilities of being Goldyear’s agents in their own countries. “All the products we demonstrate on this fair are all designed as indirect illumination, so you cannot see LED chips from any direction of our products. Compared to the traditional lens or reflector design, indirect illumination can largely reduce the glare effect to the human eyes. This new design is already patented in Taiwan and now patent pending all over the world, including China, USA, Russia, Japan, Australia, and Brazil…etc. We believe this innovation will open a new era for the LED Lighting” said Chou Huan Chiu (CEO of Goldyear Industrial Limited). Other than this, Goldyear also applies another own patent onto their new products, including special construction and coating for better heat dissipation. That’s why Goldyear’s products can keep the lowest lumen decay and meanwhile maintain the same size as traditional halogen lamps without using the large heat sink. Goldyear’s new seires of non-glare products include MR16, GU10, AR70, AR111, PAR30, and downlights, which can fit in any of the existing lighting fixtures.